Show report by Lacey Mitford, pictures by Richard Wade. 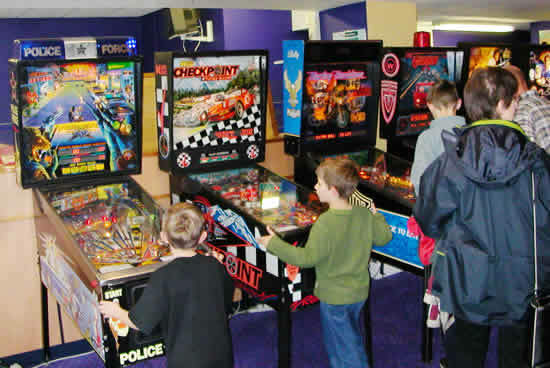 Yes, it's that time of year again, your mum's pestering you about where you're going for Christmas and you have to use a chisel to get the ice of your windscreen in the morning, but there is one good thing about October in Britain, if you're a pinball lover that is, yes, it's the Jukebox Madness show at the Kempton Park Racecourse in Sunbury-on-Thames, England. It's a show for lovers of all things retro and set on two large floors, it boasts among its wares clothes, ornaments, furniture, records, quiz and fruit machines, neon's and lots and lots of jukeboxes. 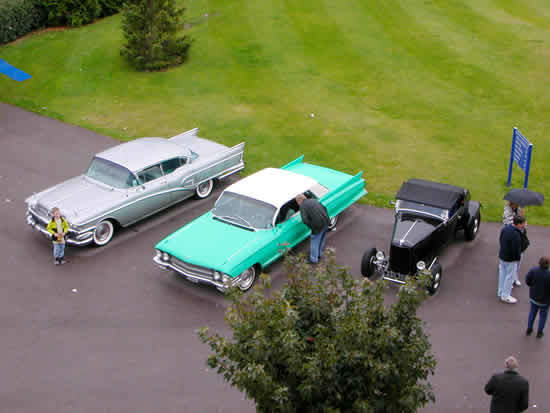 There's also a great display of American vintage cars outside. 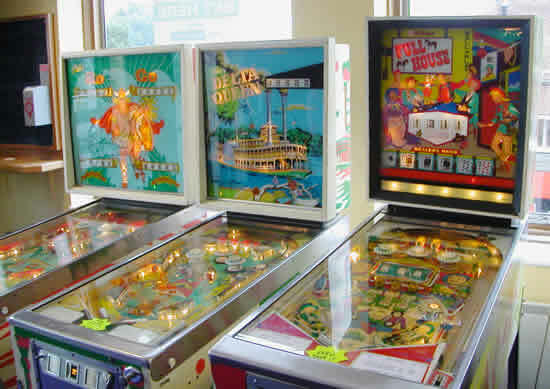 More importantly for readers of this website though, it has always had in the past a great selection of pins on show, set on freeplay and begging for a tap on the flipper or maybe even a purchase or two. Before we really start a dishonourable mention must go to the catering. At £3.40 for an overcooked potato and cheese or the next best option, an egg sarnie at £2.40 you're probably better off with a packet of crisps from the service station. Nevertheless in we went, in search of pins. The ground floor held only a few this year, disappointing considering the comparatively large selection last year. The first pin we came to was an old Gottlieb, in very nice cosmetic condition, further investigation was alas not possible, as it was sold and awaiting collection. Further searching unearthed a Goldeneye, but it too was tucked away and switched off - not looking good for connesuiers of the silver ball so far. Until, that is, we came across a nice looking Shadow on our way out, it wasn't on freeplay but one quick chat with the seller from Juke Services Ltd and on we went. It was a lovely machine and not too pricey at £850. 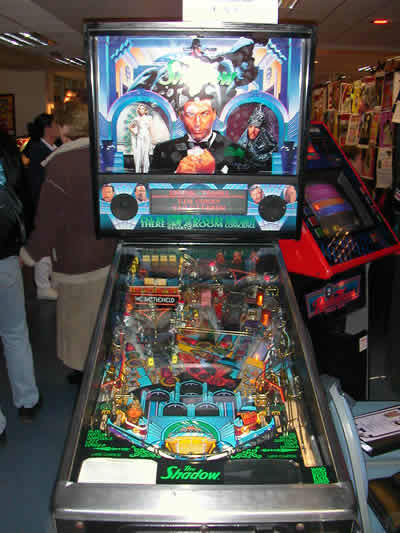 During our time at this stall, we also discovered the reason for the relative dearth of pins so far with himself was that he had been a major exhibitor at the Jukebox Madness in previous years but had got out of the pinball game to concentrate on fruties - due to rising costs and an ever diminishing pool of sellable games, the Shadow being his last remaining game, a story sadly heard many times by readers of this website I shouldn't wonder. Depressing stuff so far, but undaunted we went on up to the second floor where the our mood was considerably lifted by the betting shop area where there was a large selection of games, 16 in all, shopped, gleaming and ready to play, 11 solid state and 5 EM's. A good selection, provided by John Whyatt and another party taking in machines from many eras. All set on free play and mostly being battered in an eyewatering fashion by scores of young children. When you actually managed to flick the brats to one side and get on, all the games played well and there were none switched off or suffering from any obvious faults. Quite a feat when you consider the amount of play they must've had over the course of the weekend. This year there were no parts or flyers on sale that I could find, although we did have a great time sifting through the acres of unrelated memorabilia trying to find some. In all a fun day out, (apart from my utter drubbing on Delta Queen at the hands of 6 year old child!!!!) but a significant drop in pin variety from previous years. 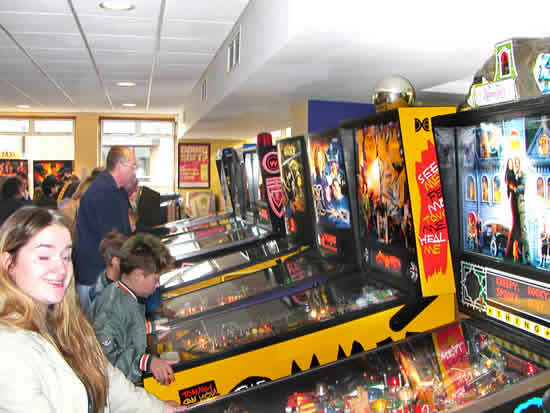 We definitely got our moneys worth from the £6 entrance fee, but it was a little disappointing, especially as this is really the only pinball show left in England.